If your business or government agency relies on a substantial library of forms to engage customers and progress them through critical business processes, then you are likely aware of the digital forms innovation announced by Intelledox on 02 October 2018. If not, you can read the announcement here. Essentially, Intelledox is putting artificial intelligence (AI) and machine learning into the hands of our clients so they can dramatically increase the speed of transforming PDF forms into web and mobile forms that adapt to the user experience. This is ground-breaking innovation in the world of online customer engagement. It completely streamlines the process and methodology between analysis of a PDF (the AI component) and output to a web interview (the machine learning component). Not only can organizations save up to 87 percent of the time and resources required to move critical forms and their associated processes online, for many of them, this is their first foray into AI and machine learning. Moreover, it represents an easy way to progress their organization’s digital transformation. Delivered as a cloud-based add-on module to the Intelledox Infiniti platform, Accelerate clients can begin seeing tangible value in a matter of hours. Accelerate is not just a cost-cutting breakthrough. This is enabling almost any user experience you can imagine, but completely intuitive, interactive, and intelligent in the realms of web and mobile. Translation ─ you can grow and accelerate revenue, reduce risk, build trust, and enact policy and legislation ─ all while reducing costs. Without giving you too much detail of Accelerate’s patent-pending technology innovation, we’d like to share some of the “under the covers” methodology with you. Intelledox engineers created an AI engine to take a PDF or non-fillable PDF and put it through a wizard process ( see wizard demo ). In that process, the AI engine assigns and discovers all the regions of interest and their locations within the PDF. Intelledox has run thousands of variations of forms through the engine, and because the technology is smart enough to identify any variable that may appear on a form (I.e. layouts, fields, images, etc. ), Accelerate does most of the heavy lifting in creating the digital instance of forms. On form analysis in particular, computer vision within Accelerate looks at a form and decides what a specific field should look like, so AI drives machine learning and computer vision to determine what elements exist on the page, what text is associated with each and can be formed into an interview question, and how the varied fields can be grouped and/or related in a logical sequence to progress a customer interview/interaction. Result of AI scan of the PDF form showing recognition of fields, question types, and field groups. Instead of your team creating forms from scratch, Accelerate kick starts your best first draft and delivers to you a digital form that is ready for online use or only requires only slight tweaking before online use. The more of your organization-specific forms go into Accelerate, the more machine learning comes into play, yielding a higher percentage of forms that are 100 percent perfect and ready to move into usage. Since Accelerate is a module of Infiniti, once you are done with form creation, Accelerate delivers an Intelledox package ready for deployment in your Infiniti platform environment. From here your designers add workflow, conditions, and data from back-office systems to create outputs that are truly customer- engaging. It’s important to note that the Accelerate engine is continuously learning. Originally tested on thousands of different forms from the industries of Banking, Insurance, Government, Healthcare, and Education, the machine learning has incorporated forms insights far beyond the module’s original knowledge base. Thus, the market lead which Intelledox has built up with Accelerate is not just technological. It is information-based and continues to grow. Accelerate will remain magnitudes ahead of any other solution in terms of the information it applies to the way organizations are designing and using their forms. 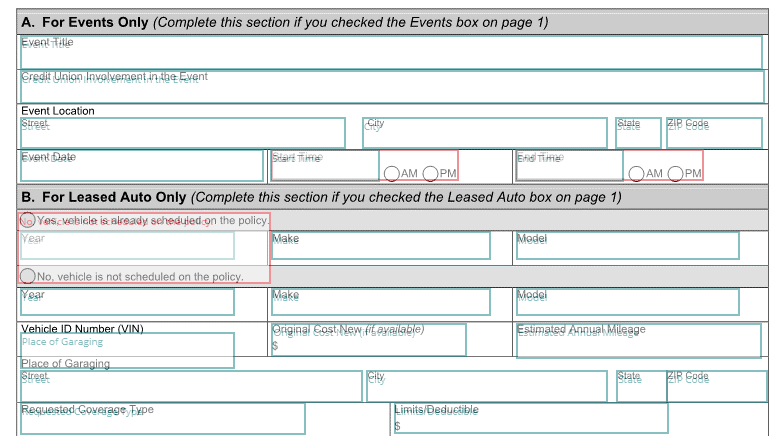 The idea for intelligent transformation of static PDF forms into digitally engaging interactive forms has been around for years. However, the technology just wasn’t ready for prime time to apply it in a meaningful and predictably successful way. As technology changed, AI elements became accessible, and Intelledox took advantage of that through a highly-focused and, frankly, brilliant engineering effort. We didn’t build our own AI engine from scratch. Instead, we actually built and trained our own model using Microsoft’s AI services and targeting them for usage over Azure (Microsoft’s cloud). Early in our model development, we recognized the sheer volume of forms libraries and all the different form variations clients wanted to transform to digital, so we jointly focused on the high-performance computing power (HPC) needed to manage the effort. Microsoft was able to deliver the HPC we needed to handle any volume of forms a client brings our way. To learn more about Accelerate, contact us today .